Parents love to record their baby's milestones! Parents cheerfully mark baby milestones in online baby books and baby journals. While monitoring your baby's developmental milestones is natural, however, it is also an important part of making sure your baby is on the right developmental path. As you watch the baby milestones that your child reaches and surpasses, you may not know exactly what to look for. Obviously, all children do not develop on an exact schedule, but there are some general milestones and developmental stages you can watch for. The list below is only for full-term infants; preemies follow a different schedule. If you feel that there is any reason for doubt or concern, don't hesitate to discuss these issues with your pediatrician. If you still aren't satisfied, seek a second and even third opinion. It is your right and responsibility as a parent to advocate for your child! Two months: Smiles abstractly and not necessarily at someone directly. Three months: Able to raise head and chest when on her tummy. Smiles directly at you and others. Can grasp small objects that are placed in her hand. Four months: Attempts to imitate sounds, babbles, and laughs out loud. Six months: Able to roll from tummy to back and back to tummy. Able to hold objects and move them from one hand to another. Seven months: Recognizes her name. Eight to nine months: Can sit without support. May crawl or creep across the floor. Twelve months: Can pull up and stand. May walk with or without support. May say at least one word. Eighteen months: Can walk without help. Has a vocabulary of 10 to 20 words. Can hold a cup. Two years: Can follow simple directions. Can form short sentences. May engage in make-believe play. 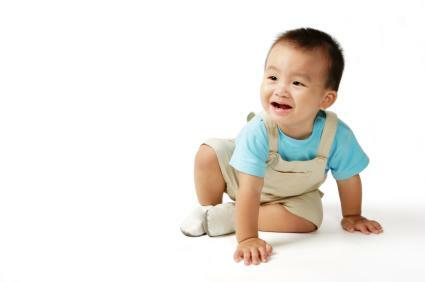 Your baby develops in a myriad of ways, and baby brain development is very important. While you might believe that your newborn really appears to just sleep and eat most of the day, there is an amazing amount of growth occurring within her brain. How can you help her brain development? You are actually helping your baby every time you interact with her and respond to her needs. The daily stimulants that your baby receives, either from her environment or directly from you, will play a huge part in the development of her brain. Each time you read, sing, hug, cuddle, and talk to your baby, you are helping to stimulate her brain!